In December 2015 Burge Bird Rescue opened The Sanctuary Room. Over 1,000 square feet is devoted to providing shelter for about 50 retired breeding birds or special needs birds that are difficult to place in adoptive homes. Three outdoor flight cages will allow the parrots to enjoy fresh air and sunshine as weather permits. Charlie, the Mitred Conure, is hanging out all alone because all of the other Mitreds he used to know have passed away. He was born in 1991 or before, so he is getting to be quite old for a conure. He seems to have a bit of a crush on Jojo the single female White Eyed Conure, and he may move in with her if she decides she likes him. 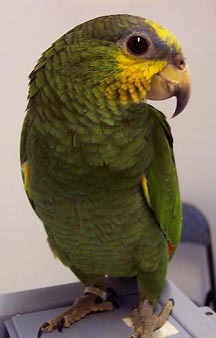 Mitred Conures are one of the largest member of the conure family, and can be quite loud. They can also be talented talkers. They were more difficult to breed in captivity than some of the smaller species, so we see fewer and fewer of them as pets.